Alone on a yacht, a sailor, listed in the credits as “Our Man” and played by Robert Redford, awakens to water rushing into his cabin. A shipping container full of tennis shoes (by the way, is anyone else reading The Orphan Master’s Son?) has scraped a hole in the hull, letting seawater rush in onto the radio and computer. Our Man methodically separates his yacht from the container, fixes the hole, dries the electronics (to no avail), and climbs the mast to reattach the antenna. Then a storm hits and damages his ship further, ruining his mast and therefore his propulsion. Incommunicado and adrift, he does his best to survive and keep his bearings. I won’t say how far the film goes, but for Our Man, it’s two steps forward, and three steps back. Our Man always proves resilient and smart, but sometimes Fate has other plans. 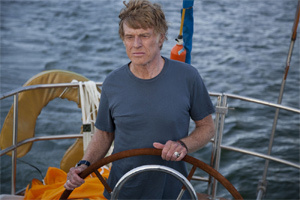 Redford was 77 when shooting All Is Lost, but he looks a lot younger than in some of his other films. His hair is still Sundance Kid, and he definitely seems capable of handling a yacht by himself, even during a storm. That’s good because Redford is asked to a lot for this film written and directed by J.C. Chandor ( Margin Call). There’s almost nobody else in the film, and almost no dialogue. I can remember two bursts of Our Man speaking, including the one at the very beginning, and that’s it. All Is Lost isn’t as sparse as you might expect, though. There is a score — sometimes the hum of violins, other times “ominous” music. Frankly I was a little disappointed to be guided by musical cues in what is clearly an attempt at minimalist storytelling, but at least the music is not intrusive or overpowering. Nor does J.C. Chandor follow the rigorous Dogme 95 principles. He includes some computer-aided and special-effects shots. The one I found a little distracting is a shot of Our Man on deck, at night, in a storm; it reminded me of Hitchcock’s deliberately careless rear projection. The practical effects, however — including a rotating set, and an amazing Gravity -like grab for a railing — are very impressive. The credits thank three yachts that were sunk in the making of the film. But the best scenes are those of Redford, alone, speechless yet conveying so much determination, intelligence, and hope. Whether to credit Redford’s performance or Chandor’s direction is a difficult choice. Chandor has thought carefully about presenting Our Man, without resorting to obvious tricks of the screenwriting trade. Our Man is not stupid, nor unprepared, nor unlucky. Yet Fate seems to have the upper hand, and it doesn’t feel like the screenwriter just playing for tension. If I think about it, I could nitpick that it’s important to the story that communications are lost, and that a lot of things survived the disaster, including a beautiful instrument in a handsome wooden case, stowed away in a single layer of plastic (too bad for Our Man it wasn’t a spare radio). But the movie almost never feels like it’s cheating. Chandor goes for a linear, fluid storyline. One segment leads into the next. Sometimes the next development is driven by Our Man, and sometimes it’s a storm or a squall. But there is no pat structure. There isn’t really a story arc, nor much in the way of dramatic themes; it’s a tragedy unfolding in a fairly natural way. That’s not to say there’s no room for deeper currents in the story. I found it interesting that the first thing that happens — the event that makes this a story at all — is that a shipping company’s cost-cutting measures have forced someone else pay the price — an “externality” in economic terms. The same idea occurred to me while watching Captain Phillips. When I saw All Is Lost, the government shutdown was still in full swing, and I couldn’t help but read the story as an illustration of the mythical Randian ideal: a smart, capable man, going it alone and not relying on anyone else (never mind for the moment that Our Man didn’t weave his own canvas, discover the compounds that make fiberglass, stock his own lifeboat, et cetera). And yet even so — as smart, prepared, and competent as he is — he probably won’t survive without help from someone else. Even the most prepared person can’t predict when nature, Fate, or some careless person might sideswipe them while they are sleeping. Sometimes our problems are caused by other people in the community pushing their externalities onto the rest of us, so sometimes we have to rely on the community to save us. We can’t always go it alone, and it’s not because we are weak or lazy or stupid. Whatever the ending to Our Man’s story (I won’t say), the values of hope and community make what looks like a tragedy into something at least a little bit positive.